Welcome and Buongiorno! 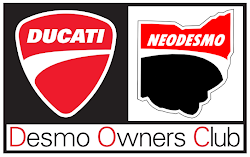 NEODESMO is the official Ducati Owners Club in Northeast Ohio, serving Akron, Canton, Cleveland, and the surrounding areas. Our partner dealership is Northern Ohio Ducati and Triumph in Akron. Membership in NEODESMO is $10 a year and the most you have to own is a passion for everything Ducati! Our 2018 events are mostly on the calendar, check it out! We meet on the second Saturday of the month for Ducs & Dogs at Northern Ohio Ducati and on the fourth Sunday of the month for Ducs @ the 'Bucks at the Starbucks in Hudson. Northern Ohio Ducati, our partner Dealer, has invited NEODESMO Members to a special members-only event at their store! Come out Friday, September 27th for demo rides, pizza, and a FREE Northern Ohio Ducati/NEODESMO t-shirt! Plus they are offering our Members discounted prices on gear and accessories - up to 50% off! *All Members that attend will be able to order their size in a special NODT/NEODESMO T-shirt! *Discounts on gear and accessories - up to 50% off! 1135 W. Western Reserve Rd. First, read our Rules & Guidelines. Then simply fill out and submit our Membership Form! online or at your first event. Dave has been riding for almost twenty years and currently owns a Panigale R and a Gold Wing. A young Freemason and Shriner, Dave competed in the Shrine Motorcycle Drill Team with the Mizpah Iron Camels motorcycle club, where he helped the team bring home several awards at regional competitions. Dave is originally from Akron and just moved back home to Ohio from Indiana in 2010, after being hired by the Cleveland Clinic as an Enterprise Engineer. He and his wife, Beth, have two little girls so far, their rescued boxers, Mela & Mica. Dave is an avid Xbox-er, a former pro Long Drive golfer, and an excellent pool player, but Beth can attest that he lives and breathes Ducati!